On one of my trips back to the Bay Area, I was tasked with cooking dinner for my parents and sister. I planned to make a Simple Roast Chicken and was looking for some vegetables to serve as a side dish. I picked up a colorful assortment of cherry tomatoes, asparagus, and baby potatoes from Trader Joe’s when I spotted a large pile of bright green globe artichokes. 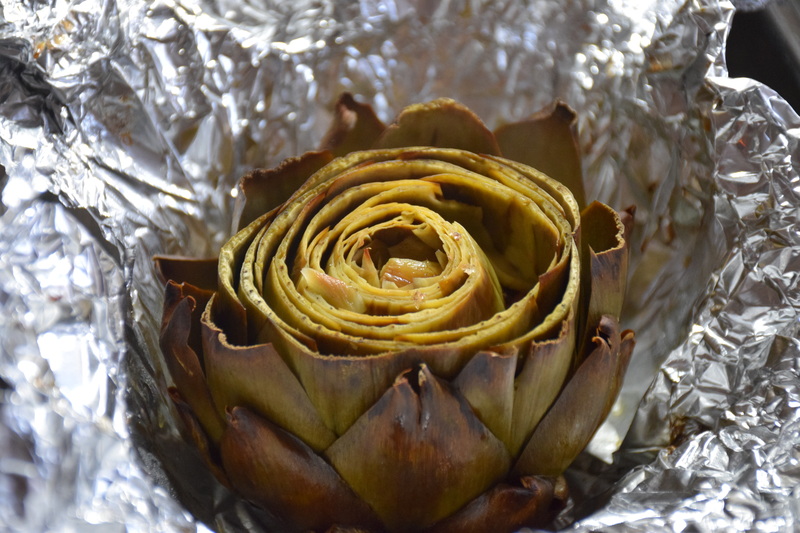 I had never tried to cook whole artichokes before as always opted for the canned hearts (such as for use in my Baked Chicken with Sun-dried Tomatoes and Artichokes). I had originally thought preparing artichokes was a bit of a waste since usually only the heart is eaten and all the tough outer layers are discarded. However, when I learned you could steam or roast whole artichokes and eat the leaves like meaty chips − I was sold! Preparation is super easy, as all you need to do really is trim the sharp thorns and stem. I prefer roasting over steaming as it truly infuses the flavors. The artichoke leaves are a great finger food and can be eaten by scraping the meaty bits off the flat edge with your teeth. Some people even dip the leaves in mayonnaise for extra indulgence. Trim the artichokes by cutting an inch from the top and cutting off the stem where it meets the base. 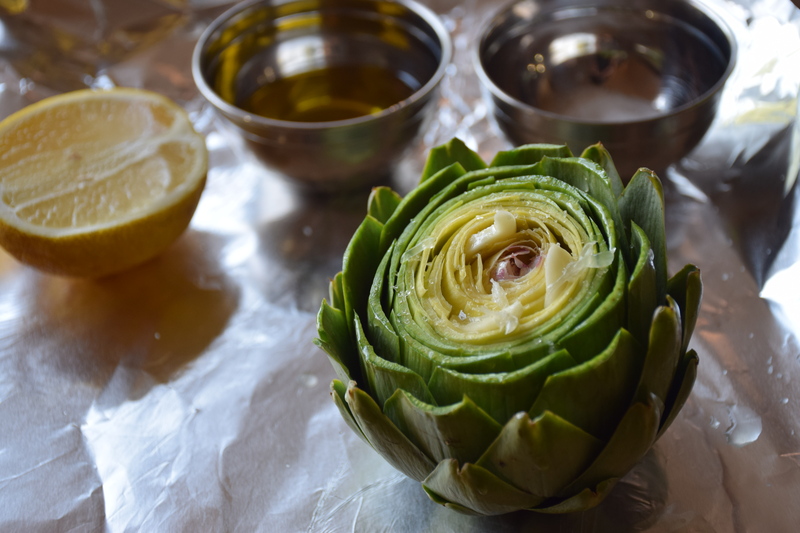 Quickly rub the artichokes with a cut lemon so it does not discolor. Tear off 4 large square pieces of aluminum foil. Drizzle a few drops of olive oil on the foil and place an artichoke stem side down. Stuff a clove of garlic into the center of the leaves and push down an inch. Sprinkle some kosher salt and drizzle 1 T of olive oil over each of the artichoke tops. 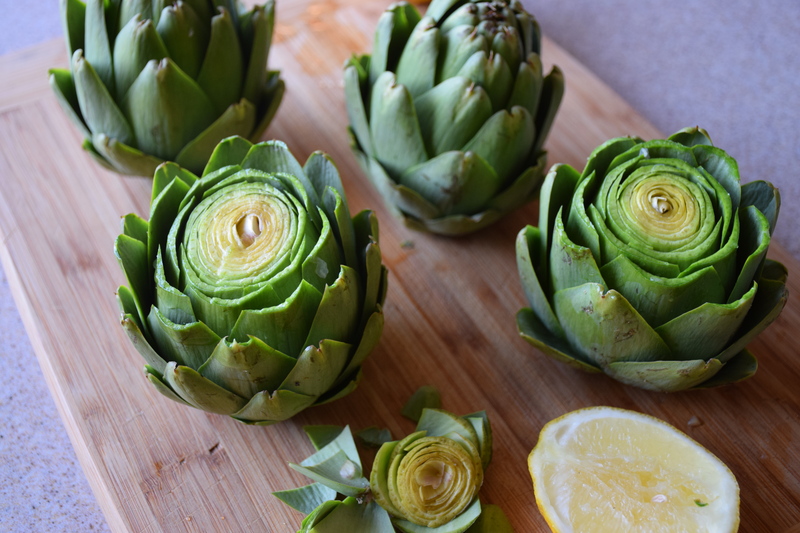 Squeeze the juice of half a lemon over each artichoke to “wash” the salt and olive oil deep in between the leaves. Wrap each artichoke with the foil and tightly seal. Place in a roasting pan and bake for 1 hour (the original recipe calls for 1.5 hours but 1 hour was enough for my globe artichokes). Allow to rest for 20 minutes before unwrapping and serving. When the leaves pull away easily, that means the meat is tender and ready for snacking! These can be enjoyed warm or chilled.